Pull Ticket – Pushing the appropriate button will dispense a parking ticket. Users can use this ticket with pay stations or the exit station to pay for parking. PantherCard (Student / Faculty ID) – If the user has the appropriate permit registered with their account, they can scan their PantherCard to open the gate. ParkMobile – The ParkMobile app will generate a barcode that is scanned by the machine. It will automatically connect the users parking to their account. This machine is used when entering a parking garage. Below is a list of the different parts of the machine, and descriptions on how they are used. This screen shows the status of the machine and the time. Only use a machine that says ‘OPEN’. This button prints out a ticket for the user. The ticket prints directly below the screen. This ticket allows users to pay for their parking at a pay station or exit machine. This is a card scanner for Panthercards. If the user has an appropriate permit registered with their account, it will lift the gate. This is a barcode scanner for ParkMobile. Using the ParkMobile app, users can generate a barcode from the ‘gated parking’ option. The machine will beep when it has been read. This allows users to call for assistance. 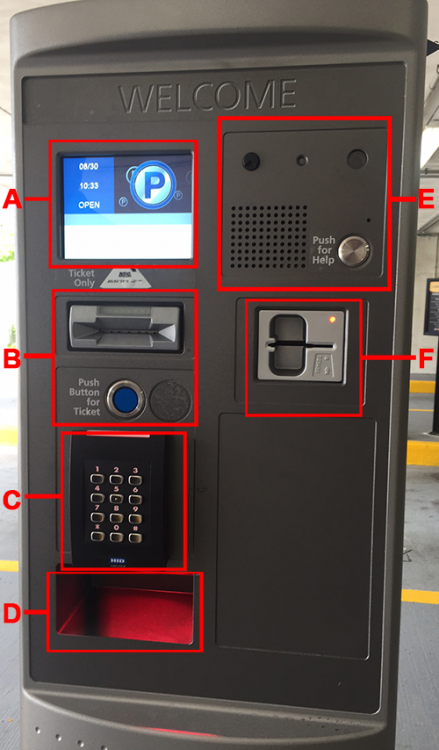 Pushing the button will connect the user with a parking attendant. It includes a speaker and a camera. This machine can be used to pay for a pull ticket obtained from an entrance machine. Machines accept both cash and credit cards and are located within the garages. 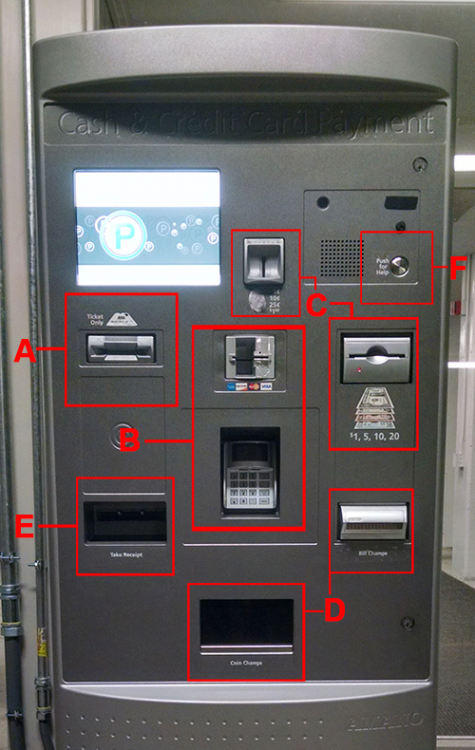 This is where a user can insert a ticket obtained from an entrance machine. The touch screen above will show payment options. This is where users can pay with a credit / debit card. Use the pin pad below if prompted. Users can pay with cash / coins. Change from a cash transaction will be deposited here. A printed receipt of the transaction will print here. This allows users to call for assistance. Pushing the button will connect the user with a parking attendent. It includes a speaker and a camera. This machine is at the exit to the parking garages. While it allows users to pay for parking using a ticket, it is strongly recommended that they pay beforehand using one of the pay stations located within the garage. This eases traffic flow during busy times. 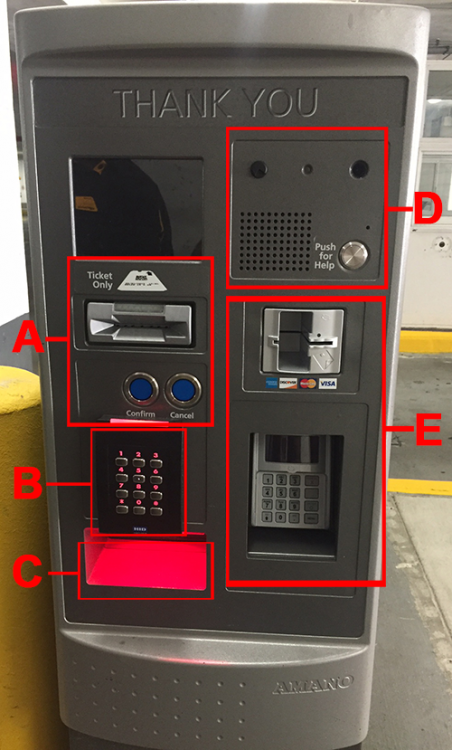 This is where a user inserts a ticket obtained from an entrance machine. It will prompt for payment if not paid using a pay station. Use the ‘confirm’ / ‘cancel’ buttons during the transaction. This is a barcode scanner for ParkMobile. Using the ParkMobile app, use the barcode generated when using the entrance machine. Payment is facilitated through the ParkMobile app itself. The machine will beep when it has been read. This is where users can pay with a credit/debit card. Use the pin pad below if prompted. Cash is not acepted at exit machines.